Leather. 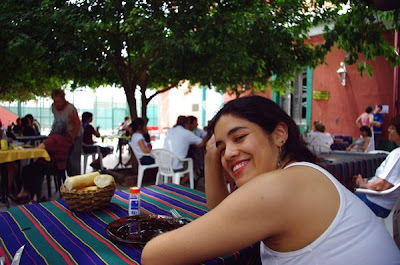 I'd been wanting to go to the barrio of Ville Crespo for a while to check out the leather district. There is a 2 block stretch along calle Murillo in between Scalabrini Ortiz and Acevedo that is one leather store after another. 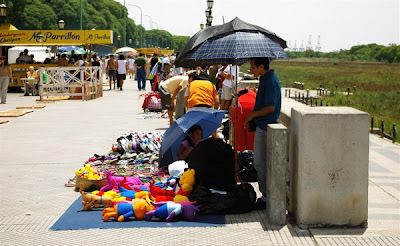 We looked around and, for me, the Paseo del Cuero had the best quality and styles. A nice leather coat will run you from US$150 to $200 at pretty much any of the stores there. 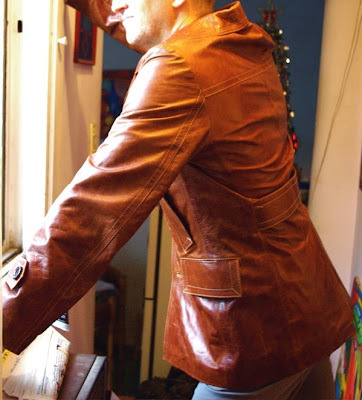 This isn't the only place in Buenos Aires to buy a leather jacket. There are high-end stores downtown in Recoleta or along the Florida Peatonal, but I believe that the coats there cost a bit more for the location and all. Plus, Buenos Aires has shopping districts - Once for textiles and clothing, Boedo for electronics, Chacarita for auto accesories (I haven't been looking to buy a car stereo; I only know this because afterwards we walked in the general direction we needed to go to catch the bus home while looking for a place to eat, which wasn't easy to find; everything was car and motorcycle accessories). Murillo in Ville Crespo is the place to go for leather coats, so why not. 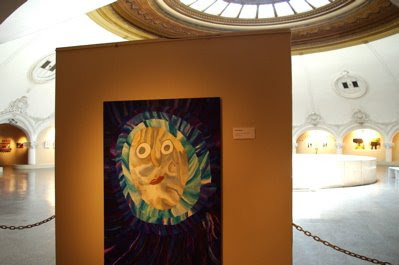 Plus, if you are staying in or go to Palermo Soho, as almost everyone visiting Buenos Aires does, Murillo is only a 10-15 minute walk away. In the evening we got ice cream at heladeria Leoyak on the corner of Avenida Asamblea and Emilio Mitre (you can just see the lights from the ice cream shop on the left side of the above photo) and took it across the street to Parque Chacabuco. It was a beautiful evening and the park was full. 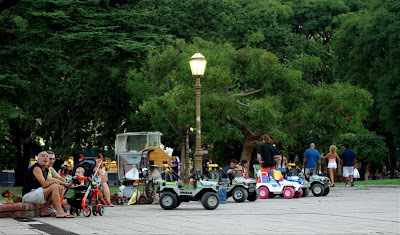 We sat and watched toddlers ride around the plaza in the little motorized jeeps pictured below, which were for hire from one of the guys over there. More on Subways and Trees. 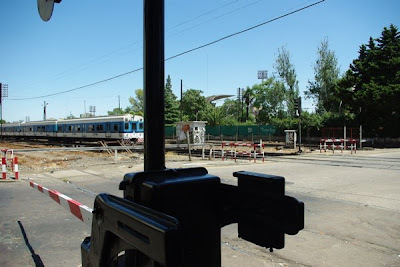 A couple weeks ago I was writing about the subway train yard a few blocks down from my apartment on Emilio Mitre and Directorio. 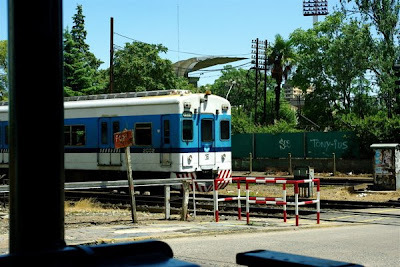 I finally saw a train yesterday being taken from the yard to the Primera Junta station on the A line. Luckily I had my camera on me. 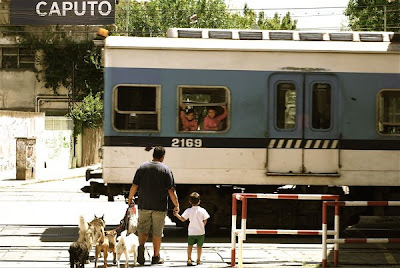 You can see the front of the train rounding the corner on Avenida Rivadavia. There's a meridian in the center of the avenue that has tracks that descend down to the underground subway station. Again, you can see how old the subway cars are on that line, and how odd it is to see a subway running the streets. A couple weeks ago I was also writing about how there were a record number of complaints about out-of-control trees destroying sidewalks, patios and bathrooms around the city. Here are the testimonials from that newspaper article (translated by Google, so it doesn't read perfectly, but you get the idea). 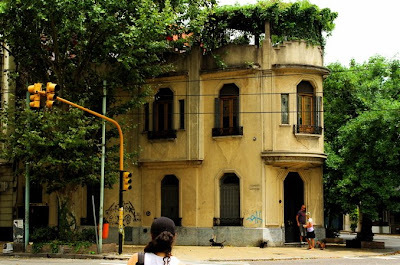 This is a street in Flores, a middle to working class barrio in central Buenos Aires. Look at how big the tree is (its probably 50-60 feet high, and that's not even really big compared to others I've seen) and all of the wonderful shade it provides for the house, sidewalk and street. Now look at the trunk (no, the trunk) of the same tree below. It takes up more than half of the sidewalk and the roots are so big that they've cracked, undulated and warped the sidewalk on all sides. I didn't knock on the door of the house pictured, but for all we know the roots are coming up thru the floor and toilet there too. Supposedly the city is responsible for pruning trees and repairing sidewalks (home owners aren't allowed to do it), and it is simply overwhelmed by the number of complaints and amount of work, and has many bigger priorities. But to look at the trees and how much relief (from the heat) and life they give the streets - on this little walk to my spanish teacher's house I saw lots of people sitting on their front door stoops, lounging in front of their houses with the dog, etc ... - I like to think that people here appreciate the shade more than walkable sidewalks, so given the choice between big trees and safe sidewalks, the trees win. Plus, seniors here must have strong ankles and a great sense of balance, because they need to just to walk down to the store, which helps prevent hip fractures I suppose. Random Photos. 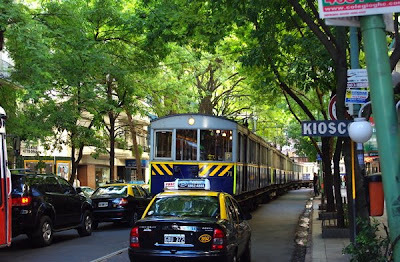 Here are a few random photos from Buenos Aires. The files are a little bigger than they appear on this page, so if you click on them you can see them a little better. This couple was coming out of their house just as we were crossing the street. The door opened and three miniature dogs charged out ahead of the couple. I liked this house. You can see its two levels and has a roof terrace covered by vines ... which may have been grapes. It's style is pretty typical for Buenos Aires ... the beautiful windows and ironwork. The windows are glass and wood french doors and there is a second set of steel shutters on the outside to block out the sun, noise and for security. This house only goes from the corner to the stoplight (you can see the wall/paint changes just before it). It probably has a kitchen, bathroom and two small living areas on the ground floor and two bedrooms and another small living area and perhaps another bathroom on the second floor. That's a good size house for Buenos Aires. This house was in a decent area, and I imagine it would go for between US$200, 000 to $250,000, which is expensive by local standards. To give you some perspective, US$20,000 is a good annual salary here (minimum wage is US$5,000 a year, though most of the work force is black market so that figure may not mean much). My guess is that it probably costs more than US$1,000 a month for a small family to live here, and home loans aren't common here (which has turned out to be a blessing for the country because families who have homes generally own the outright so they don't loose them when the economy turns downward), so buying a house, let alone a nice house like this, is out of reach for most unless they have help from family or save their pesos for many years. This gives you a perspective on how meaningful it is for someone to have family working in the U.S. or Europe. If they can even send a few thousand bucks a year that could double what their relatives here make, and contribute to their ability to afford a house one day. A home is the most desirable form of saving here because most people don't participate in or follow the Argentine stock market (I've never heard anyone even mention it here) and domestic banks aren't a reliable place to keep your money given the recent history of inflation, currency devaluations and restricted access to accounts. The peso was devalued by 66% in 2001 when the country defaulted on its national debt, and since most people had their bank accounts here denominated in pesos, it declined by an equal amount relative to the dollar, euro, pound. The only way to avoid it were having money denominated in dollars in US or European bank accounts (only the very rich have this). Hence, people want a home. If the economy goes to hell, at least they have a place to live that is paid for. 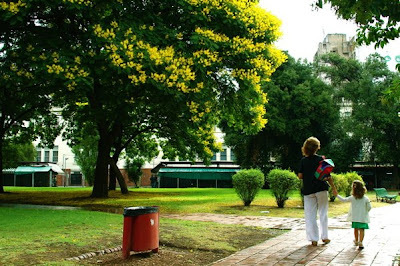 This is a park in the ecological reserve downtown on the other side of Puerto Madera. 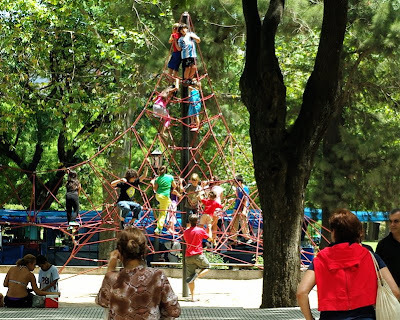 I was surprised at how tall this little jungle gym was (20 feet) or more, and that parents would let their kids climb all the way up there. Trains and Soccer. I found a short-cut to the bus line that takes me to Flores where I have my spanish lessons a couple times a week. It takes me across these train tracks just a couple blocks away from my apartment and past the stadium of the soccer club 'Ferrocarril' (the literal translation of the word is 'steel rails' but it means railroad or train). You can make out the stadium in the photo above, and see it more clearly in the photo below. then clay tennis courts a little further down the street, and then a big old mansion-like club house that has summer camp and activities for toddlers among other things. It's like an Argentinian version of an east coast beach or golf club, except it looks as if it's slowly falling apart (see the broken shutters in the pic above?) Everyone knows each other (I think we were the only ones eating that weren't part of the club) and everyone's soccer team is Ferro. Little kids wear their miniature soccer jerseys on the street and the spirit of the whole little neighborhood exudes the team. But Ferro isn't as successful and therefore doesn't have the resources of the best premier league teams. For example, I asked around where I could find a jersey or tshirt with the team's name and logo. A security guard at the entrance to the club told me there was a store on the corner of Neuquen and Espinosa. I went there yesterday and didn't see it, so I asked at a newspaper stand on the corner and they directed me to a little shop that sells school supplies and trinkets for kids. In the back of that shop there were some coffee mugs, banners and such, but no jerseys. The woman working there told me they might have some this coming week once the new season starts. It's entertaining just to sit at the intersection and watch the trains go by. 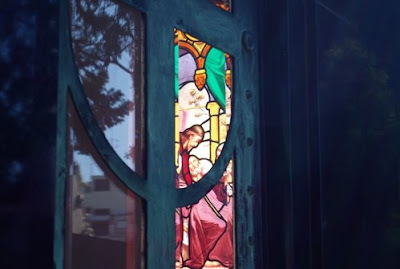 Through the door of a mausoleum in Cemeterio Recoleta where Eva Peron is buried. Duck season, Rabbit season, Duck season, Rabbit season, Tuna season. This is a picture of a cactus fruit or 'tuna'. I saw them last year when we were in Bolivia and in the last week or so I've started to see them in vegetable and fruit stands in Buenos Aires. I'm not sure if it's the season (we were in Bolivia in February last year) or I just hadn't noticed them before. They taste a little bit like honeydew, but have seeds, as you can see, and aren't quite as sweet. 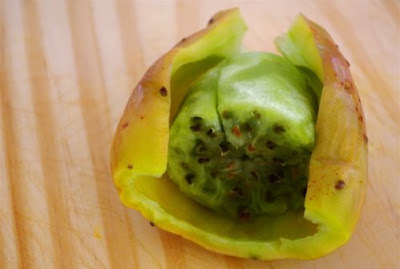 You cut the skin, open it up and the fruit in the center just sort of peels right off of the inside. 'Verdulerias' (tiny vegetable and fruit shops) are common in Argentina. There isn't a lot of produce in most of the grocery stores, and what there is is gross. Verdulerias are usually tiny holes in the wall. They put their fruits and veges out in crates and you buy by the kilo or fraction thereof. For some reason, many of them are owned and run by Bolivians, and I think they do pretty well. The parents of a schoolmate of Rosana's brother came to Argentina, managed to start a verduleria and now they have two as well as two houses. 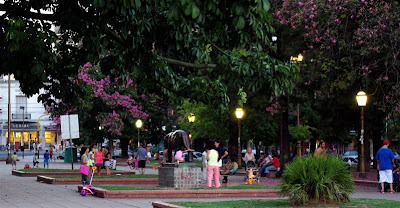 Today I went to Parque Rivadavia in the late afternoon and sat and watched the action. 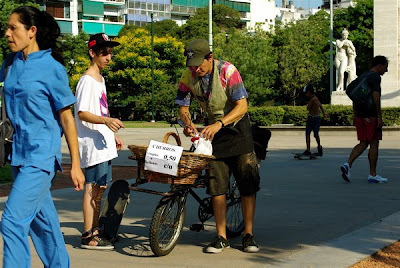 This guy came by selling churros (plain and stuffed with dulce de leche). Judging from the kids and babies all over the place, there aren't many virgins in Buenos Aires, but there seems to be at least one in every subway station. 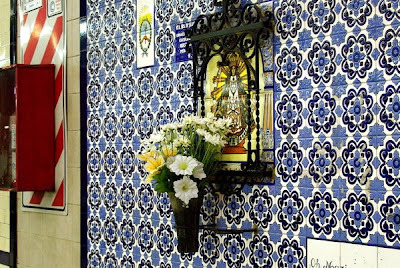 This a pic of the Virgen de Lujan, the virgin saint of Buenos Aires, on the subway platform at Acoyte station on the A line. She's there to watch over us and make sure we arrive safely at our destination. Reserva Ecologica. 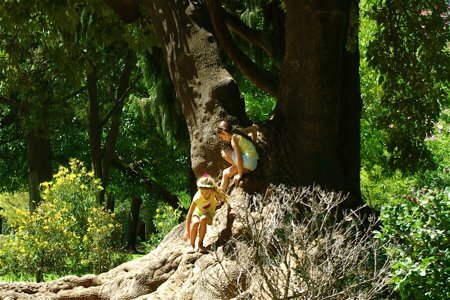 On Sunday we went to the ecological reserve in Puerto Madero. Puerto Madero is the old port district in Buenos Aires that was redeveloped with office buildings, restaurants and luxury condominiums and hotels. If you walk along the boardwalk you'll see office buildings for Oracle, IBM, Sun Microsystems, Microsoft and the like. It's on the very edge of the city, beyond downtown from me, and I've only been there a few times. Just the other side of the redeveloped part of the port (the last strip of land before you hit the river) is this boardwalk and an ecological reserve pictured to the right of it. The reserve is an open wetlands type space that has been left as is with indigenous growth, iguanas, etc ... and there is a 5 mile loop that runs around it which you can run or bike. Rosana's dad and I ran it while she hung out in the park. It was sunny and beautiful, and an iguana ran across our path. Afterwards we found her in the park. 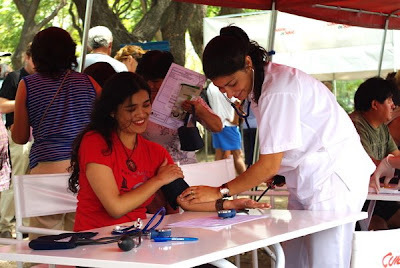 Right near where she was, the Ministry of Health had set up a tent where you could get your weight, height, blood pressure, sugar and cholesterol checked by medical students from the Facultad de Medicina. We wandered over there. I'm here to tell you that eating beef, cheese and ice cream everyday actually lowers your cholesterol by 25 points, or so it would seem (actually, I think it has more to do with the 'how much' than the 'what' you eat). 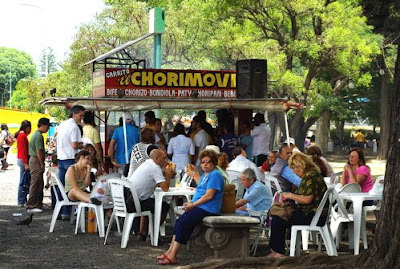 Argentines eat richer than I am accustomed to, but eat less and walk more. There's obesity here too, but by and large they are smaller and slimmer. The ironic and entertaining this about the tent is that it was set up right next to one of the grilled steak and sausage sandwich stands than line the boardwalk and park and look just like this. They really good, especially the grilled sausages or 'choripan' with chimichurri sauce, but not as good for you as boiled beets and salad. Having run for almost an hour, Rosana's dad and I had 'bondiolas', which are steak sandwiches with grilled onions, lettuce, tomato and a fried egg on top. Evil Trees. Today the ongoing saga of the lack of coin change in the country hit a new low, or at least a new personal low. Until now I had been doing pretty well, dumping all of my spare change into an ashtry in my apartment and hoarding it for bus fare. But I ran out today and I needed to ride the bus to my spanish class in the afternoon. I knew there were a bunch of banks on Rivadavia along the several block walk to my bus stop, and took solace in the fact that I could always go to the bank as a case of last resort to exchange a 10 or 20 peso bill for change. My first stop was Bank Itau, which limited me to 2 pesos in change, just enough for the trip to and from class counting what was left in my pocket. I decided to hit a few other banks because I had a few minutes to spare. HSBC didn't have any tellers, and the lines in Banco Santander were too long, but there were only a few people waiting at Banco de la Provincia of Buenos Aires, so I got in line. After patiently waiting for several minutes I thought I overheard the teller tell a woman that he didn't have any coin change. Sure that couldn't be the case, I waited for the next person to go to the window. I thought I heard the same thing again, so when she turned to leave I asked her and she confirmed my worst case scenario ... even the banks don't have change. I'm not sure what to do. I will make a special trip to all the banks I can find in my neighborhood tomorrow morning, and failing that, I will buy lots of alfajores that cost $1.25 or $1.50 and relish my coin change. When you talk with Argentinians about this they think its ridiculous too. But their attitude seems to be that they somehow find away to get just enough change to get thru the day and to and from where they need to be, and sure it's an inconvenience and yet more evidence of how the government can be inept, but there are bigger things to worry and to complain about so why get heated-up about change. This is a photo of Parque Rivadavia near my bus stop. It rained today for the first time since I've been back from Salta (there's a bad drought here), so there weren't a lot of people in the park this evening. 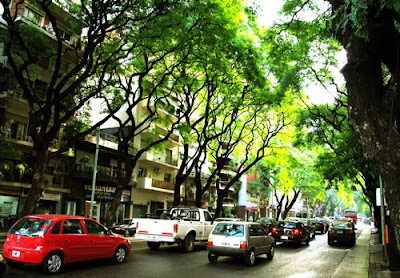 The trees in Buenos Aires can be beautiful. There are jacarandas with bright violet flowers and this tree with yellow flowers. But the best trees are the old, tall ones that line many of the neighborhood streets. 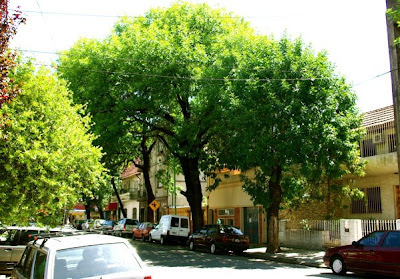 In some places they are 6, 7 or 8 stories tall and the branches reach over the street from either side to create a giant green shady canopy along the whole block. The best I've seen is along Pedro Goyena near Emilio Mitre. Apparently they are also evil and, according to an article in today's newspaper, in 2008 there were a record number of complaints against them for roots that crack sidewalks (that part is true, the sidewalks here are a disaster), branches that break electric poles or stoplights and ... my personal favorite ... 'invading houses'. According to the article, a 67 year old retiree has complained that a tree keeps rupturing the sidewalk outside his house and (it's roots) entering the toilet in his bathroom as well as breaking the floor in his front hall. His 78 year old psychologist neighbor confirmed his story, saying that she has lived in the neighborhood for almost 50 years, that the tree has been there at least that long, and that 4 years ago the roots got into her plumbing and broke her patio.